EasyXLS™ library allows you to import Excel data to ResultSet. The data can be imported from an Excel sheet or from the active Excel sheet. The entire sheet data or only data from ranges of cells can be imported. The below example shows how to import Excel to ResultSet in Java and Coldfusion. 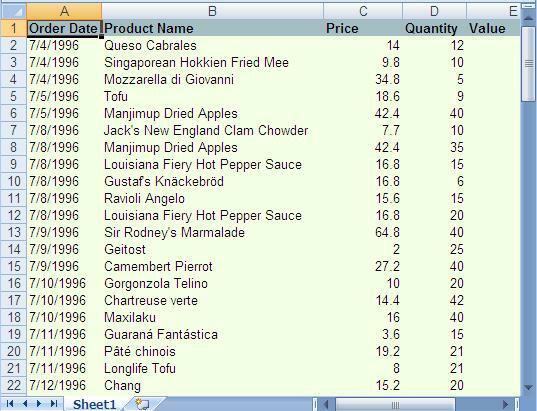 This screen shot shows the imported data from Excel sheet into ResultSet. Then, import the sheet data in ResultSet using ExcelDocument.easy_ReadExcelWorksheet_AsResultSet method. EasyXLS enables you to import Excel data to ResultSet either from the entire sheet or from a range of cells. Importing only a range of cells is a very useful option especially for large Excel files because it reduces the speed of the import process. All the methods that allow importing Excel to ResultSet have parameters that permit importing only ranges of cells. How to import from XLS file? How to import from XLSX file? How to import from XLSM file? How to import from XLSB file? After installation, you will need to create a Java project and add EasyXLS.jar to external libraries.